Mirrorthrone is one of Vladimir Cochet’s many projects. He comes from Switzerland and he is the founder and only member of three active bands: Mirrorthrone, Unholy Matrimony and Weeping Birth and he released a new album in 2008 with each of them. Even though the three projects have some similarities, Mirrorthrone has a more experimental atmospheric approach, Unholy Matrimony a more black, and Weeping Birth a more death metal approach. “Gangrene” is Mirrorthrone’s third album, after “of Wind and Weeping” in 2003 and “Carriers of Dust” in 2006. Compared to the two previous releases I can say this album is more solid and powerful, with less atmospheric parts and a more aggressive mood. Even though Vladimir plays everything himself, the sound is amazingly full and he performs surprisingly well in all instruments. The drum programming (that was his first albums’ weakness) is much improved, and it sounds almost like real drums. If you know Vladimir’s previous works, “Gangrene” will satisfy you, without being his best work, but standing at the high level standards he has set. 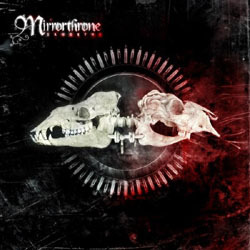 If you are new to Mirrorthrone, expect to find atmospheric symphonic melodic black metal, in a variable tempo and with great technical skills. He has a very personal sound, recognizable in all of his projects and Mirrorthone have a darker nostalgic (almost baroque) mood. Vladimir is definitely a talented musician, or better a complete artist, since he does everything in his works; even the artwork of his cds, and he has nothing to fear compared with other “professional” artists. His orchestrations are very rich with guitars and keyboards cooperating perfectly, creating a really complete sound. Some piano interludes with ecclesiastic classical influences add a lot to the great atmosphere of the album and they work as relaxing melodic melancholic intermissions (he is so good I believe he could compose a whole classical music album with great success!). Lyrics are in English in some songs and in French in others. His vocals are deep black screams, while he also uses clean vocals in the more melodic parts and his is unbelievable good in both of them. All of the instruments are in the right level and his production is almost perfect, very much improved compared to his first efforts.